What are the system requirement for installing Nevron Writer? WINDOWS: If you are a Windows user you need to have .NET 3.5 Framework (or higher) installed on your computer in order to run Nevron Writer. How to activate your Nevron Writer? Install Nevron Writer on your computer and run the program. Go to the File menu on the top left corner of the window and select About. This will open a separate small window, on the bottom of which you will see the Copy Machine Id button. Click the button, paste it in the email and send it to support@nevronoffice.com. Your license key will be added to your account within one business day. 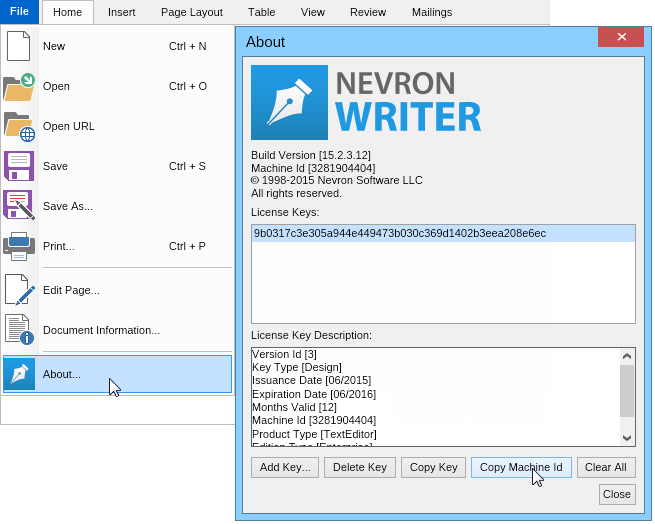 When you receive the license key, open Nevron Writer again and navigate to File menu --> About. In the bottom left corner press the Add key button, paste the license key and click OK.
Nevron Writer is activated and fully functional. Enjoy! If your computer crashes and you need to re-install Windows your machine ID is going to change. In case this happens, your license key for Nevron Writer will no longer be valid. Please contact support@nevronoffice.com in such occasion. As mentioned above on this page the number of the licenses you need to purchase depends on the number of computers you want to install Nevron Writer on. 1 license = 1 computer.